I hear the cries: "Consternation! What's he at this time? It was bad enough when he tried to cross breed computers and steel needles. How on earth does he do that with a 2015 high-end audio show? And more importantly, why? 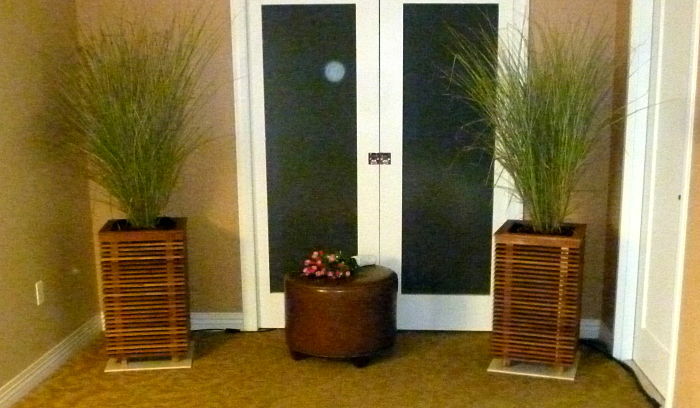 Were Victrolas on display in the lobby?" Well, as that computer article should have demonstrated beyond doubt, I'm always interested in how modern technology reflects or interacts with or echoes that of the early days of recording. Beyond that, we shall see. 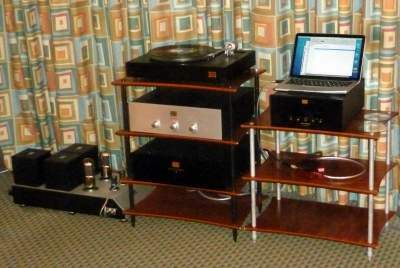 For several years now, the Washington, DC metropolitan area has enjoyed its very own high end audio show: the Capital Audiofest. I covered the 2013 show for TNT, and I tried to last year, when my efforts foundered on a string of mishaps: I arrived so early not even all the "anchor" exhibitors had set up; I was fighting a splitting headache (alas, from undersleep and a lousy breakfast, not anything remotely fun the night before), not the best condition in which to visit strings of overwarm hotel rooms full of powerful amps playing full out; I managed to park in a bad spot and got a big parking ticket; and by the time I had frantically run through every room, I had overstayed my familial allotted time, incurring spousal wrath that we would be late getting our daughter to an ice skating lesson. We actually did get there in good time, but, needless to say, for some time any suggestions I made that I should take some time out to write an article were met with a response making that ice rink look positively tropical by comparison. By the time things calmed down enough that I could give it a try, my recollections were so jumbled that I found myself unable to write anything coherent about the event. Learning from last year's mistakes, this year I took a different approach. Once again, family commitments left me with limited time, but this time I waited until the show was well underway and just hit a few rooms that looked interesting. Result: here I sit, the same day, writing up a summary. As to coherent, well, you can be the judge! My approach isn't the only thing that has changed since last year. When the show started, some years back, it was held in a modest venue (a historic mansion, if I recall correctly) in Rockville, Maryland. Then, as it grew, it moved to the Sheraton Hotel in downtown Silver Spring, Maryland, another DC suburb. 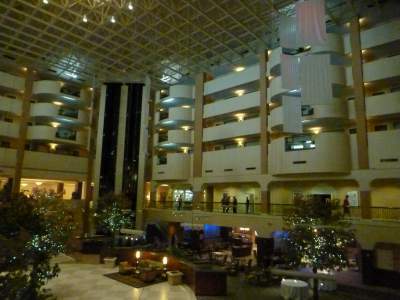 This year the venue shifted back to Rockville, specifically to the Hilton Twinbrook, whose atrium appears in the adjacent photo. The drive is a bit longer for me (I live in Silver Spring), but I must say that the new facility is nicer. For one thing, the Hilton is big enough to accommodate the show on just two floors; at the Sheraton, it was split across four or so. Moreover, the Hilton's elevators run between floors at request; the Sheraton's will go up only with a room key, meaning access to those upper levels was a matter of waiting to hitch-hike with a hotel guest. After I checked in, my first stop was the room for Luminous Audio Technology, Fern & Roby, and VPI for a little excursion into heavy metal. Not heavy metal music, mind--if memory serves, what was on offer was the seemingly ubiquitous smooth jazz--but heavy metal equipment, specifically the Fern & Roby turntable, a two-speed unit (the expected 33.3 and 45 RPM) which features a 70-pound (almost 32 kg) cast iron plinth and 35-pound (almost 16 kg) bronze platter. According to the company, that platter rides on a precision single-point bearing dynamically balanced to 1000 RPM. Propulsion is by a belt riding on an external pulley, and a little light next to the speed selector comes on if the speed, measured through a precision-cut comb wheel under the platter, drifts off beyond a tiny deviation. 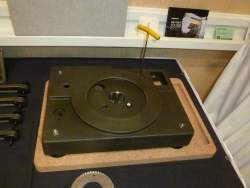 The photo to the left shows a completed turntable; that to the right the plinth casting. As luck would have it, I got to chat for a few minutes with Christopher Hildebrand, one of Fern & Roby's principals and a moving force behind development of the turntable. Naturally, that 1000 RPM specification caught the attention of this lover of fast-turning records, and so I asked if there were any plans to add a 78 RPM speed. He said that he'd considered it, but 45 is already about at the outer reaches of what the present motor can deliver. He added, however, that he remained interested in exploring that possibility and that he'd even been talking to his software consultant about creating an app that would let the user dial in an RPM setting. Next stop: the Ultra Audio room for probably the most eye-catching speakers I encountered: the Ultra Audio tube-powered ribbons. A picture, it is said, is worth a thousand words; the adjacent ones probably are worth ten times that in mine. I will spill a few, however, to say that while I hardly got time to hear them, what little I heard sounded great. Not sure how they would fare in terms of WAF (about which more below), but in suitably contemporary surroundings they certainly would make a statement! By contrast, the most handsome speaker cabinetry in a traditional way belonged to the rebuilt Quad ESL 57 speakers in the Emia Audio room. Emia prefers "redesigned" to "rebuilt," and each speaker is made by hand to order. 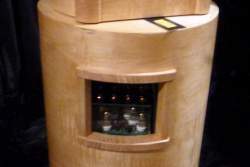 Features include built-in triode biamplification with custom transformers; upgraded power supplies; refurbished 3 micron mylar film panels; and custom-designed, furniture grade frames clamped to the panels via brass cones. 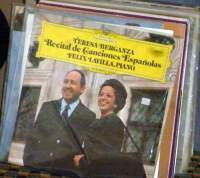 My little camera's photos don't begin to do justice to the lovely quality of that woodwork, and the sound (in a welcome departure from smooth jazz, Teresa Berganza singing Spanish art songs), sourced from a likewise heavily modified Garrard 301, was luscious. The (not terribly surprising) bad news? All that custom work will set you back well north of $30,000. Moreover, each set of speakers is rebuilt to the customer's specifications from scratch, meaning there's a substantial wait for delivery after ordering a set. That said, these were my "if money were no object" choice for what I saw at the show this year. I suppose I'd better add "if space were no object." When I showed the photos to my wife, expecting she would take an instant dislike to the Ultras but immediately fall for that premium furniture grade cabinetry housing the Quads, she opined that the latter are indeed handsome but take up far more room than is practical, at least in our domestic circumstances. The Ultras, on the other hand, she thought would be striking in the right room, especially if fitted out with a plant on top of each. (!) Now, understand, my wife and I are no gardeners, and all our interior flora are of the silk variety. It all goes to prove the female of the species, to borrow a felicitous phrase from Mr. Churchill, remains a riddle, wrapped in a mystery, inside an enigma. These are designed for outdoor service, but, the representative hastened to tell me, they also can make a tasteful yet tuneful addition to the interior domestic scene. They are part of an entire catalogue of speakers disguised as flower pots and planters of various descriptions. The distinctive enclosures, if faintly evocative of cubistic teak carrots as displayed, are eye-catching, in a a contemporary, Danish modern sort of way, and with proper cultivation they undoubtedly would be less intrusive in the living room than your average black box or monolith. Alas, I really can't offer much of an impression from the perspective of how they actually sound. In part, that's not the exhibitor's fault; I stumbled into that room--or, more properly, was roped into it by the representative--on my way out, with essentially no time to spend on a fair audition. It didn't help, though, that the available demonstrator discs included next to no classical tracks (but plenty of smooth jazz), and I really need reasonably familiar classical fare to form any fair impressions. (I ended up making do with a snippet from the slow movement of one of the Tchaikowsky symphonies, hardly the sort of thing calculated to show off the limits of what a speaker can do.) 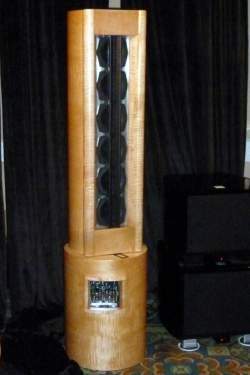 I can say that the Piermonts are only moderately sensitive--somewhere in the high 80s, if I recall, suggesting they need a fairly beefy amp--and they cost on the order of $6,000 a pair. 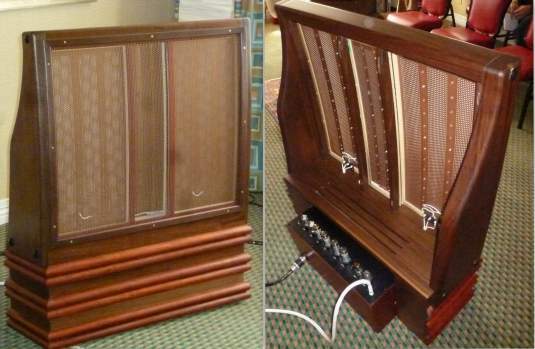 At the Now Hear This suite, I received a very warm welcome when I mentioned that my amplifier at home is a Rogue Sphinx. There I learned that Rogue is planning a series of upgrades to the Sphinx to be released later this year. Among them will be enhancements to the phono stage, already well regarded, and to the headphone amp; improvements are also in store for the amp's noise floor. Mind you, none of that was any secret; the company itself has announced the new edition on its website: http://www.rogueaudio.com/New.htm#newstop. At this point, I'll pass to the room with the best sound of the show, thanks to a cello. 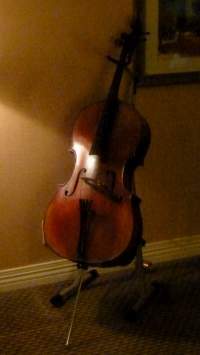 No, not Cello, the audio brand, but a cello, as in the musical instrument. 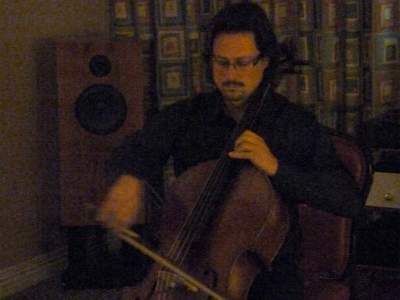 Of course, a cello is no use without a cellist, and David Cope, Audio Note's room host, came through splendidly by arranging for a young Canadian, Vincent Belanger, to perform casually throughout the show. When I arrived, he was playing "The Swan" by Saint-Saens. Here's a photo; apologies for the rather dim quality, but I didn't want to disrupt his performance with a flash. Mr. Belanger proved articulate when speaking as well as when playing. He talked about his ongoing project to record a collection of cello rarities that will be available as high resolution downloads. I asked him about special challenges in recording the cello; he replied that placement of the bow along the string can make an immense difference in the sound of the instrument. We also delved a bit into the microphone placement for his series and how it relates to the particular recording venue chosen. And here we finally reach the connection with vintage recordings. Audio Note was by no means the first company to put a live performer and audio gear together to show how closely the latter could simulate the former. Beginning in 1916, the Edison company began sending members of its recording roster across the country to perform in large auditoriums live next to its phonographs; at a point in the program, the lights would be put out and the audience challenged to tell whether it was the musician or the phonograph that was playing, and when the lights came up the performer would no longer be on the stage. Supposedly, a surprisingly large percentage of these audiences couldn't tell the difference, although I have seen somewhere one of the participating performers noting, years later, that they would tailor their own sound to match the phonograph as closely as they could. Naturally, the amount of equipment involved in these demonstrations of old differed from that in their modern counterpart. For the show, Audio Note sent its CDT Three CD transport, DAC3.1X Balanced digital to analogue converter, TT Two Deluxe turntable fitted with Arm Three arm and IQ3 cartridge playing through an M3 phono preamp, and Jinro Shochu 211 amplifier driving E/SPe speakers. The adjacent photo shows the entire rack but not the speakers. 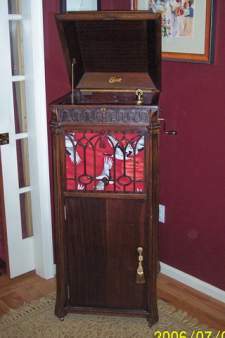 By contrast, Edison's system was one fully contained unit, usually a Chinese Chippendale C-250 (later rendesignated C-19) Diamond Disc Phonograph. Sometimes the W-250 (W-19) William and Mary would do the honors instead. The two were functionally identical, differing only in case design. The adjacent photos show the C-250. It, like the W-250, featured Edison's most powerful, two-spring motor; an automatic stop (usually mechanical, but sometimes battery-operated electrical); a "tone modifier," or volume control; and the largest horn Edison fitted to his disc machines at the time. This combination of features entitled these machines to be designated "Official Laboratory Models" for marketing purposes, and each bore a medallion in the playing chamber to that effect. As a digression, on the turntable of the machine in the photos is one of the Edison long-playing diamond discs. Only in this series did Edison issue 12" discs, like the one pictured, to the general public. As recounted in an earlier article, the Edison long-playing discs ran for 12 minutes per side in the 10" size and 20 minutes per side in the 12" size, all playing at 80 RPM. These never figured in the tone tests, although all were dubbed from conventional standard play diamond discs. 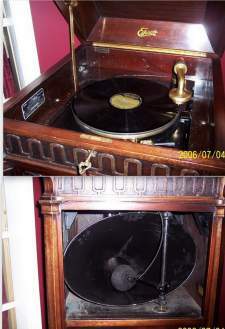 For various reasons the long play series was not a commercial success, but it's worth noting that to play one of these records, you needed either one of the "Long Playing Consoles" issued specifically for the purpose or else a long-play attachment for an existing diamond disc machine; of these, only the "official Laboratory Models," with their massive two-spring motors, could play long enough on a winding to deal with the 12" long-playing discs. Well, if in print a picture is worth a thousand words, for audio a recording is worth a million. Sticking with the theme of cello music, here is an Edison diamond disc recording of cellist Paolo Gruppe in an arrangement of "The Song to the Evening Star" from Wagner's Tannhauser. It's an early entry into the Edison disc catalogue, dating to 1913, and is played back on my ca. 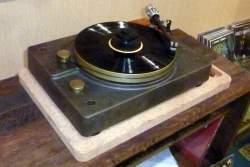 1928 "Edisonic Schubert" diamond disc player. For the, er, record, the Edisonic machines--of which there were two, the "Schubert" and the "Beethoven"--were Edison's penultimate gasp answer to Victor's Orthophonic line, designed to play the earliest electric recordings. The Edisonics had a somewhat larger horn than the Standard Laboratory Model series, but otherwise their mechanism was very similar. I fitted this one with a reproducer (playback head) of the early type in use when the record was issued; standard equipment for the Edisonics was a later design optimized for louder playback at the cost of increased record wear. Dutch-born cellist Paolo Mesdag Gruppe (1891-1979) was the son of a noted painter, Charles Gruppe. At age 9 Paolo entered the Hague Conservatory; he soon transferred to the Paris Conservatoire. He settled in the United States after first undertaking a two-year concert tour that began in 1909. Thereafter he taught and was active in concert, ensembles, and radio broadcasts into the 1940s. As far as I know, he recorded only for Edison.